This immaculate 2800 sq. ft., 5 bedroom vacation home located on 3/4 of an acre comfortably sleeps up to 14 people or 2-3 families and is a very high demand rental home for family gatherings. Cable and High Speed Internet. The kitchen seats 12 for large dinner gatherings and is equipped with all your cooking needs including a griddle, George Foreman grill, slow cookers and blender. No amenity is missing. The five large bedrooms located on 3 levels of the home allow for quiet and privacy for all. A crib is available for your use if needed. There is a television in every bedroom as well as the two family room areas. Each level boasts a large bathroom with lots of counter area and spacious showers. The beautiful fireplace in the great room is a perfect place for family gatherings. The outdoor fire pit allows for evening sing songs and making S'mores. Enjoy Boyne's Zipline Adventure all year long. Fall colours are pristine in this area. Bike paths throughout the Boyne Resort make for great trail riding especially during the Fall season. Enjoy Fall's reduced golf rates on 2 of Boyne's Courses located on this property. During winter months ski on Michigan's best downhill runs and enroll your children in the fantastic learn to ski programs. Cross country ski trials literally surround this home. Skidooing, ice fishing, tobogganing and snow shoeing can all be enjoyed just outside this home. This is a winter wonderland getaway that is hard to match. Ski out from the top of Boyne Mountain from the Kitz Cabin Parking lot located directly behind the Super Bowl Run. The ski down access is just a short block walk/ski or drive from this home. Ziplining is offered all winter long as well. During summer enjoy the beauty of this secluded home across the street from the Golf Course- Alpine 4th hole but the closeness of all the modern conveniences of being on Boyne Resort property. Bike/Walking/Running trails through Boyne start right in front of this home. . Just a short walk to the chair lift for rides down to the main resort and restaurants during the summer/fall season. Deer Lake is just a 3 minute drive through the golf course to the bottom of the road. This is a warm, sandy bottoms,shallow lake for swimming seadooing, kayaking, canoing, sand play and having cocktails from the Tiki Hut. This beach is perfect for families who have little ones. The popular Beach House Restaurant is located right on the beach. Boaters will love the close proximately of this home to the many lakes in the area. Shopping, wine tours, epicurian restaurant delights, summer festivals and day trips all await you including some favorites-Mackinac Island, Beaver Island, local State Park Beaches, Charlevoix, Petoskey, Boyne City and Traverse City. An up-to-date itinerary book with local attractions, restaurant suggestions, things to do and events to take part in is provided in the home for the convenience of visitors. One of Michigan's largest water park Avalanche Bay can be enjoyed anytime of the year. A great rental location for your Morel Mushroom Excursions in the spring and Fall Colour Tours in Autumn. Children's Daycamp Programs at Fritz Day Camp, access to the Clock Tour Pool and Hot Tub & nightly planned family activities at the Grand Lodge are just a few of the amenities available to renters of this home. The owners of this home are 25 year established corporate event planners and can help you with any of your special event, catering, pre wedding stay needs and questions. A book full of area restaurants, activities, day trips, shopping and golf details for this area is updated regularly and available in the home for renters. 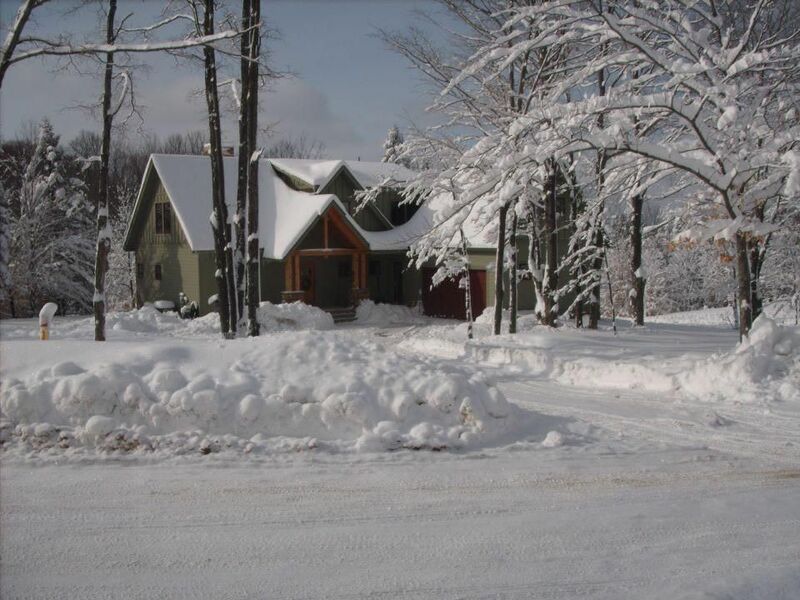 Our names are Rob and Nancy and we purchased land in the Reserve on Boyne Mountain in 2006 and decided to build a family vacation rental home in 2008. We have built this home so that families can enjoy a place to come and relax in a serene atmosphere and feel like they have never left home. As Corporate Event Planners it is in our blood to make sure every detail is covered and our renters find our home the ideal location to spend their down time. Our vacation home is equipped with everything you need and more. Whether you travel to our place in summer, winter, spring or fall there is something unique in each season to enjoy about the area and the nature that surrounds you. We look forward to hosting your family at our vacation rental getaway. We decided to build a vacation home on Boyne Mountain because this area lends itself to wonderful family vacations for those who love nature and are outdoor enthusiasts. We love everything that Northern Michigan has to offer. We are Canadian and the commute to Northern Michigan is much easier for those of us living in Southern Ontario than the commute to Northern Ontario...no Toronto traffic to fight through. We built this home knowing that there were many families like us looking for a place to gather with their families. We love the fact that our renters share memories at our vacation home that will stay with them for many years to come. The spaciousness of our 5 bedroom home and the comfortable style of its decor make you feel like home the minute you walk through the doors. You will love the fact that you feel you are surrounded by nature but a 5 minute drive down the mountain will take you to all the conveniences that life has to offer at Boyne Grand Mountain Lodge including an indoor water park and fine restaurants. Within a 45 minute radius drive there are day trips that can take up to two weeks to cover. We always say there is never enough time to do what we want to do when we are up at Boyne Mountain...the options are endless or as simple as just putting your feet up, relaxing and enjoying the beauty of your surroundings. Salt and Pepper, some general spices, coffee, tea and condiments like ketchup, mustard and hot sauce normally available. We loved our stay at the Campana cabin. Although it was just the four of us, we hosted friends we met on the hill and we could see how this cabin could be host to many more with much comfort! Nicely equipped and furnished with enough beds and baths for a large group. Our extended family had a great time at this cabin this past week. It's close to Boyne for skiing, only a block away from the ski run, but you will need to be a bit more advanced to make it down the run. Plenty of room for all 11 of us! Great sledding hill out the back for the kids to play on, our 7 and 8-year-olds had a blast! The downstairs area is almost like a small apartment, great for a crib set up and can be close to parents in the downstairs bedroom. If you have different family members that have different bedtimes, this house can carry voices and noise making that a bit challenging. All in all, a great place, super clean, well stocked and a beautiful location!! We had a girl's weekend getaway and loved this home. We played games at the large kitchen table. The furniture was comfortable which is not always the case. We saw deer out of the big picture window. The spa at Boyne was wonderful. Highly recommend this home & the spa!! We are so glad you enjoyed your girls getaway weekend. Our goal as owners is to ensure our travellers feel all the comforts of home the minute they walk through the door of our vacation home. We were pleasantly surprised by the serene setting and lovely home. Thank you. One of the favorite features of our home is it is right on Boyne Mountain with all the conveniences of a resort setting but at the backside of the mountain surrounded by peace. And at night the starry sky is uncomparable. Wow, I have been visiting and golfing in Northern Michigan with family and friends for many years, and this by far was the my most rewarding trip ever. The accommodations were outstanding. The amenities were never ending, from sleeping arrangements to kitchen and eating areas. I went with friends that had been to this property before, they told me what to expect, but seeing and staying at this wonderful property far exceeded my expectations. I would like to thank the owners for taking the time to make this property feel like home as soon as you walk in. I cannot wait to visit this property again and to enjoy what I would call a perfect vacation spot. Thank you so much. We are glad that you loved the combination of fine dining located right on Boyne property and in Boyne City along with the option to eat in and enjoy good food and friends!